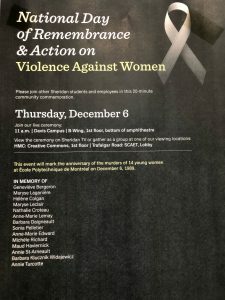 National Day of Remembrance and Action on Violence Against Women is a day to honour the 14 women who were murdered nearly 30 years ago because of their gender. On Dec. 6, 1989 Marc Lepine entered a class at Montreal’s Ecole Polytechnique and opened fire. He targeted the women in the class, yelling the words “you’re all feminists.” He then turned the gun on himself. Since that day, the effects of this tragedy continue to be felt and women are still victims of gender-based violence. Andrea Bebee, a public education coordinator at SAVIS (Sexual Assault and Violence Intervention Services) of Halton explains what could be done to help this issue. “In all cases related to gender-based violence, we believe working in a preventative manner, instead of reactive, will have great impact on our communities in the Halton Region and beyond. In particular, we think education is a great tool whereby we can empower youth, survivors and allies and have them come together to eliminate all forms of violence,” says Bebee. President and CEO of the Canadian Women’s Foundation, Paulette Senior, says the Ecole Polytechnique shooting has had lasting impact. “What happened on Dec. 6, 1989 was an unimaginable tragedy, and one of the worst acts of gender-based violence we’ve ever seen in Canada,” says Senior. “The women who were targeted students at a technical college – they were planning to work in traditionally male-dominated arenas like engineering. Imagine the message this sends to women and girls about STEM professions who were already struggling to fit in male dominated spaces? Not only do you not belong here, being here is dangerous. It’s horrific on so many levels. “Everyone has a role to play in eliminating gender-based violence, and we can’t achieve freedom from violence without action on the part of government, industry leaders, and the public,” she says. On Dec. 6 Sheridan students and employees will gather at 11 a.m. at Davis Campus for a live ceremony to mark the anniversary of the murders of the 14 women and to commemorate the National Day of Remembrance and Action on Violence Against Women. There will be viewing locations at the Creativity Commons at HMC and the Peace Garden at Trafalgar Campus. Alyssa Parkhill is a journalism student at Sheridan College. She is an avid reader, and displays a strong passion for writing and all things literature.